Nicki's Diapers Black Friday SALES! 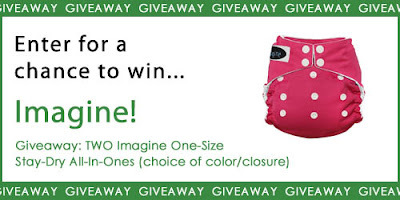 Imagine Stay-Dry AIO Giveaway WINNER! 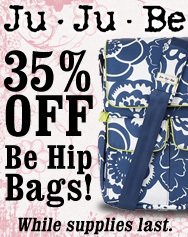 FREE shipping on all Diaper Bags in the US!! Shortly after becoming a cloth-diapering mama, I began thinking how silly it was for me to be pouring expense into feminine hygiene products. After all, hadn’t I saved a ton of money by AVOIDING the disposable-aisle of diapers? Here I was, mindlessly shopping each month for menstrual supplies. I purchased my first DivaCup almost 5 years ago ~ and haven’t looked back. Never a fan of bulky menstrual pads, I wanted something that would replace tampons. The Diva Cup does exactly that. It is this comfortable little silicone cup that is completely reusable. When positioned correctly, it cannot be felt at all--truly. The makers of the Diva Cup recommend replacing it annually, which means that it lasts through at least 12 cycles ~ costing me a mere $2.75 per cycle. When I purchased it I was very skeptical – it seemed too good to be true. But it really is simple to care for. I have never tried DivaWash, since my family uses natural/unscented soap on a daily basis. I simply use what we have on hand and have never had any sensitivity issues. Every now and then I sanitize my DivaCup by placing it for three minutes in a pan of boiling water. A nice bonus is that it takes up the TEENIEST amount of storage space. In my home, and in the landfill. It has freed all this space under our bathroom sink! One little tiny product, one little shy secret…spread the word…. Guest Blogger, Stephanie, is a homeschooling mother of three boys and lives in Madison, WI. She began cloth diapering in 2006, stumbling across Nicki’s Diapers back when it was online-only. She will never forget the day of her pilgrimage to Nicki’s first retail store in New Glarus ~ having never seen all that fluff in one place, and oh-the-joy-of-it! A happy and loyal Nicki’s customer for going on six years. Yesterday Imagine Baby Products released 2 new products to their economical and bullet proof cloth diapering line. In this blog post, I'm going to tell you about the features of the new Imagine One-Size Stay-Dry All-in-One and tell you why I think every cloth diaper stash needs a few of these on hand! 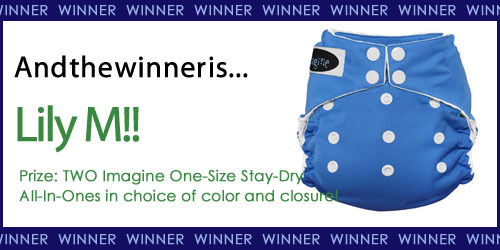 At first glance, the Imagine One-Size Stay-Dry All-in-One looks like any other all-in-one diaper. It's completely waterproof on the outside, offers a snap up and down rise in the front to fit babies 8-35+ pounds and is available in snap or hook & loop closure. 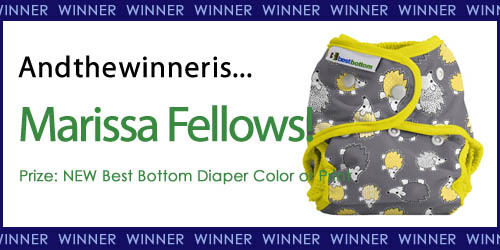 Open it up and you'll find out what sets this diaper apart and makes it a smart buy! The entire inner of the Imagine One-Size Stay-Dry All-in-One is lined with super soft polar fleece. This means your baby has only the most gentle material touching their skin. The 4 layer microfiber soaker pad is extremely absorbent and is also topped with the same polar fleece to wick away moisture and keep your little one feeling dry. The insert is snapped into the front. That means that no matter what snap rise you use, the absorbency will be where you need it to be. This also keeps the diaper nice and trim fitting in the back, which can sometimes be a difficult feature to find in a one-size diaper! Something very unique about the Imagine One-Size Stay-Dry All-in-One is that you can utlize other snap-in inserts from the Imagine Baby Product line. One of my favorite options is the new and improved Imagine Bamboo Soaker Pads. Snap one of these babies in your Imagine One-Size Stay-Dry All-in-One, lay your stay-dry soaker on top and you've got a GREAT overnight diaper! Bonus: Because the absorbent soaker pad is removable, washing the diaper in a piece of cake! No stinkies from sewn in absorbency and the insert can be deep cleaned if build-up or yeast were ever to occur. Why is this diaper a must-have for any cloth diaper stash? This no-frills diaper is easy for anyone to put on your baby! Babysitters, grandparents, and spouses that are hesitant to use cloth diapers will find this cloth diaper just as easy to put on as a disposable diaper. There is no stuffing, folding or removing of inserts. These also make the perfect diaper bag diaper. No other pieces to remember with this diaper, toss one in your diaper bag and you're set! Finally, this diaper is so reliable that it would be a great diaper to build your entire diaper stash from! A cloth diaper newbie would feel confident using this diaper! It gets even better, for a limited time the Imagine One-Size Stay-Dry All-in-One is on sale for only $10.95! That's an unheard of price for a top quality All-In-One. Grab some to try out risk free, our 15 Day Wash Program insures that you'll get full store credit if you don't love it (but we know you will!). 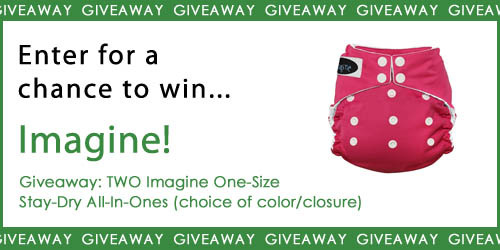 Would you like to win a set of TWO Imagine One-Size Stay-Dry AIOS? Head over to our facebook page and click on the giveaway tab! FREE shipping on all Diaper Covers, Pocket Diapers and all orders over $75!